There is no need for the operator to crawl under the machine to perform this service task, thus increasing the probability of the job being performed and completed safely. The rotor bearings are now made of steel and have a three-lip seal to keep the dirt out and increase the life of the bearings. The side and center bearings now have guards in order to avoid leaks and dust, increasing the life of the bearings. The transmission is bolted directly to the frame. This gearbox has a constant-duty rating of 180 hp and a maximum rating of 270 hp. It carries a limited two-year warranty. Kevlar is a U.S.-registered trademark of E.I. du Pont de Nemours and Company. 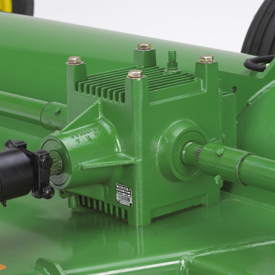 Designed for superior rotor strength, the square rotor, together with the opposite-mounted flails, provides a machine with less potential vibration, increasing the life of rotor bearings and belts. Since 248 knives are mounted on the full length of the rotors on the main cutterbar, with 2.5 cm (1 in.) of overlap, a stalk won't get missed. 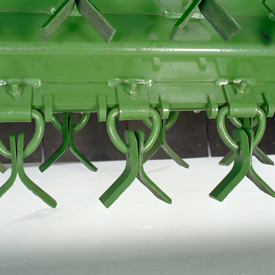 This is a significant improvement over the 216 knives mounted on the previous 220 Flail Shredder. 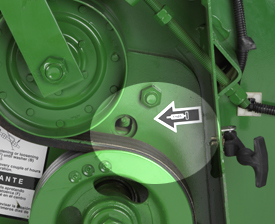 The 520 Flail Shredder can be ordered with two different types of tractor hookup, drawn or integral, depending on preference. 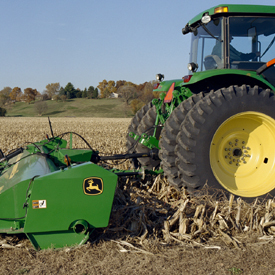 An integral flail shredder allows making a very tight turning radius, even when the tractor is equipped with dual wheels. 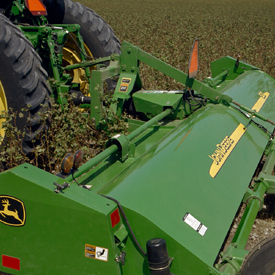 The flail fastening system eliminates clogging from mud or crop residue. Its bracket design also helps prevent knife and ring loss. 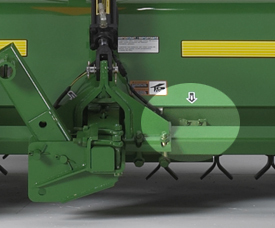 Optional wheel supports eliminate the uncut middle strip in crops like wheat, oats, and barley. 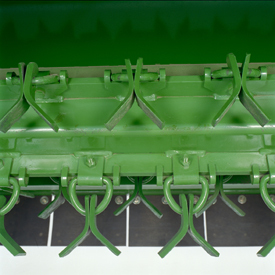 The shredder can be pulled at an angle, offsetting the rotors and cutting evenly across the entire width of the machine. 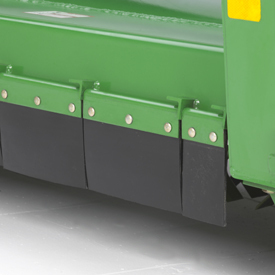 Front rubber deflectors keep debris and other materials under the shredder and away from the tractor and operator. Because they are made out of rubber, they will not dent or rust.